Summer time is time for glaciologists to get busy on glaciers … in my case its fixing weather stations, drilling ablation stakes, trying my first dye tracing experiments to see how long it takes meltwater to pass through the glacier we are studying, setting up automatic cameras, some thermal imagery, and hopefully some surveys with unmanned aerial vehicles (a.k.a., in this case friendly, drones). 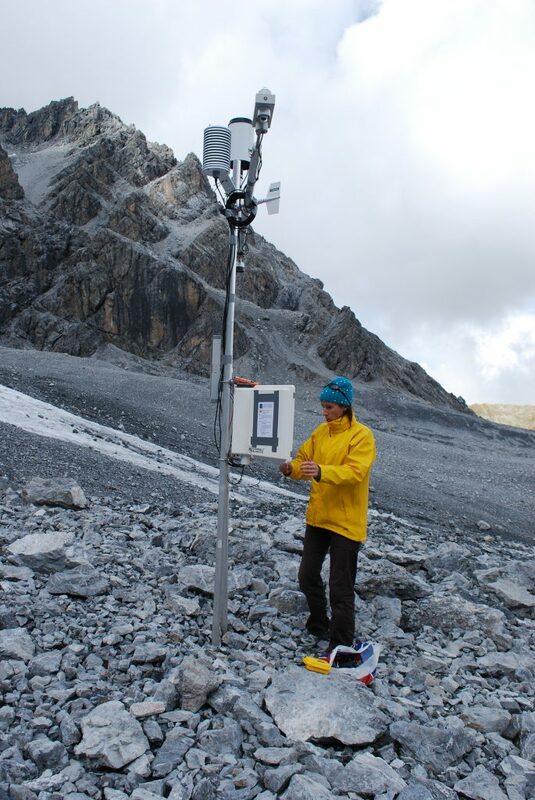 Here is me looking puzzled by my weather station on Suldenferner. I’m probably about to lower the sensors to be a little bit closer to the glacier surface. There are a number of sources of useful information for undertaking glacier fieldwork, aside from having the requisite safety skills to hang around on glaciers a fair bit, while concentrating on other things. An early document providing background to the modern glaciological fieldwork is “Combined heat, ice and water balances at selected glacier basins: A guide for compilation and assemblage of data for glacier mass balance measurements“, published by UNESCO/IASH in 1970. This was substantially updated and replaced by “A manual for monitoring the mass balance of mountain glaciers” written by G. Kaser, A Fountain and P. Jansson, also published by UNESCO in 2003. There is also the more more recent UNESCO/IACS “Glossary of glacier mass balance and related terms” led by G. Cogley and published in 2011. An early full textbook on these techniques was written by G. Østrem and M. Brugman in 1991: “Glacier Mass balance measurements: A manual for field and office work”, and the more recent “Field Techniques in Glaciology and Glacial Geomorphology” by B. Hubbard and N. Glasser, published by Wiley in 1995 expands the scope to many geophysical and geomorphological techniques relevant to glaciologists. So there it is, wishing you success and fun out there! Viel Spaß auf den Gletschern! Disfruta tu tiempo en los glaciares!